The main entry promotion is a Packable Jacket but a Free Gift With App Download Sign Header adds extra impetus to enter the store. 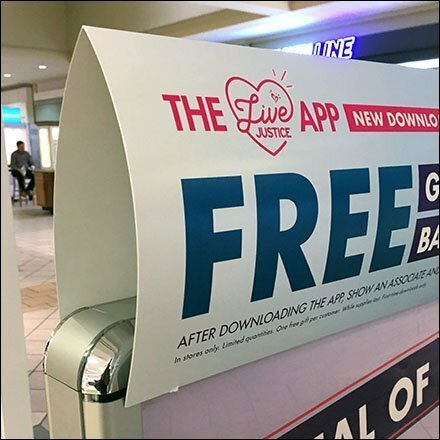 No matter where or how you downloaded the App, at home, in-store, or in the Mall Concourse, pop into the store, show a Sales Associate, and claim your free gift. This Free Gift With App Download Sign Header an added promotional outreach of Claire’s. See that it attaches to the main sign for extra exposure.